One of the world's most desired badges is that of Mercedes-Benz. When you have a three-pointed star leading the way, it is a clear symbol that you have made it! This German marque has a way of grabbing your attention, especially when you're spending 'big bucks'. 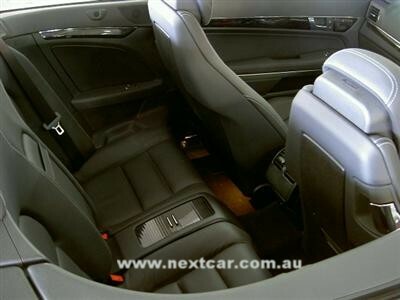 For example, their latest E-Class is available in a range of body styles. These include sedan, wagon, coupe and cabriolet. 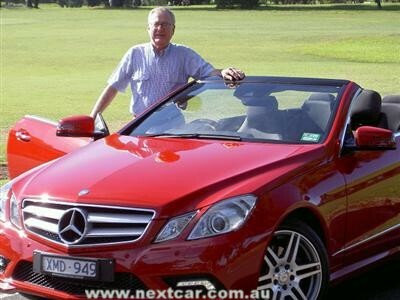 Next Car has driven the Mercedes-Benz E 350 cabriolet. This rear-wheel drive model is fitted with a petrol-fuelled 3.5 litre V6 motor with 200 kW of power and 350 Nm of torque. The transmission is a seven speed automatic. Fuel efficiency is rated at a commendable 9.8 litres (premium unleaded) per 100 kms on the combined cycle. Fuel tank capacity is 66 litres. The E 350 cabriolet is just under 4.7 metres in length and weighs 1,765 kg. The payload capacity is 470 kg. How much for the E 350 convertible? It is priced from $141,685* (MLP*). The road test car was fitted with numerous options including Vision Pack 1 ($5,950), AMG Sports Package ($5,700), Dynamic Handling ($1,700) and Anti-Theft Package ($1,200) taking the total MLP* for the test car to $156,235*. Now that is certainly big bucks. But it is difficult to imagine any buyer having any regrets with this car. Mercedes-Benz has found a way for you to be delighted beyond belief with such a big spend. Standard equipment for the Mercedes-Benz E 350 cabriolet includes 18-inch alloy wheels, AVANTGARDE interior, AIRSCARF neck-level heating system, COMAND APS with 6-disc CD/DVD, heated front seats and so much more. But the real delight comes with driving the E 350. This is one mighty fine automobile. 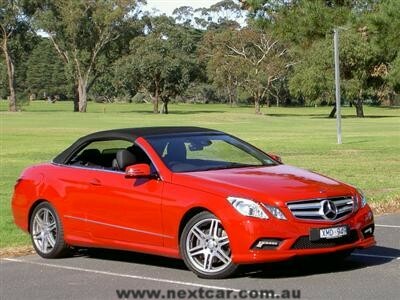 On the road, the Mercedes-Benz E 350 cabriolet imparts a particularly pleasant driving experience. The performance is quite good, but the driving mannerisms of this convertible is exceptional. It does not matter if the hood is up or down, cruising in this car is just so pleasing. With the smoothness, the dynamics, the style and the superior comfort all playing a part in the overall scheme of things, this car goes as good as it looks! Our 305 kms behind the 'wheel' attested to our thoughts. Performance is more than satisfying with factory figures indicating 0-100 km/h comes along in just 6.9 seconds. This type of performance should please even the most dashing amongst us. The power delivery, besides being effective, is smooth and quiet. Taking a grip on the steering wheel is good because the 'wheel' is thick, thus you get a solid feel. By the way, there is a neat trick with the steering wheel. It raises to aid easy entry/egress when you turn off the ignition. In addition, the steering wheel features 4-way adjustment. 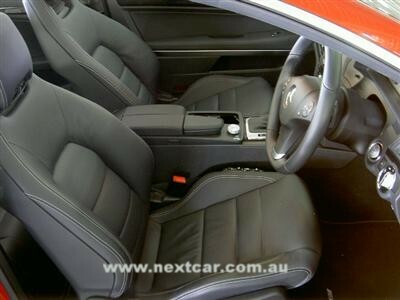 Another convenience feature is the power-operated retractable seatbelt assistance mechanism for the front seat occupants. Interior lighting is good for the front seat occupants. And the power-operated front seats are comfy. I formed the view that the driving position was perfect for some-one like me. The rear seating is 'individual' for two (see accompanying image). Dual-zone air conditioning is standard. The glove box is suitable for gloves only whilst the door 'pockets' are quite narrow and, as such, will have limited storage use. Other appreciated features of the E 350 include keyless entry, push-button ignition, steering wheel audio controls, user-friendly cruise conrol and parking sensors. This E 350 also had retracting external rear-view mirrors. 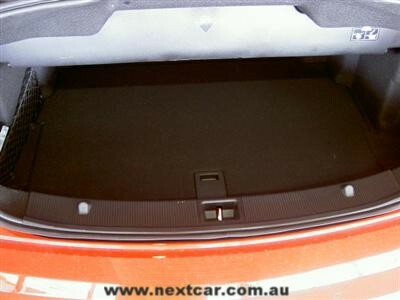 At 300-390 litres, the boot is larger than I would have expected (see accompanying image). If anything is outdated on the E 350 it is the easy to use foot-operated parking brake (with hand-operated release). Whilst this system keeps the centre console free from an obstructive hand-operated parking brake it is time for Mercedes-Benz to move on (so to speak) and install an electric parking brake. This could be either a driver operated manual system with a centre console mounted button or the more modern automatic application. Yes, these days an automatic electric parking park can detect when the ignition is turned off and, at that time, apply the parking brake. Too easy! 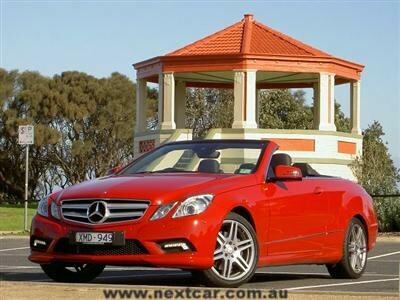 The Mercedes-Benz E-Class cabriolet is available in four versions. In addition to the "E 350" (the subject of this road test), there is an "E 250 CGI" with a 1.8 litre turbocharged 4-cylinder petrol engine and an "E 500" with a 5.5 litre petrol V8. Additionally, a 2.5 litre 4-cylinder turbocharged diesel is also available, this version being known as "E 250 CDI". Make no mistake, the Mercedes-Benz E 350 cabriolet is no ordinary car. It impresses the driver with every aspect of motoring. 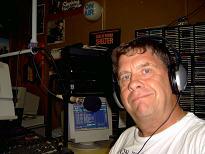 It's a great way to drive down "Easy Street". 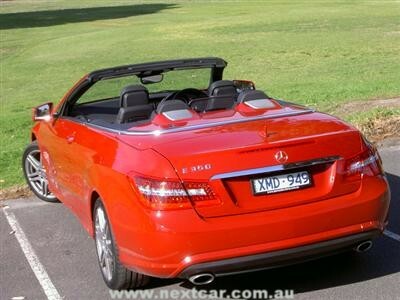 Here's my prediction ... if everyone was wealthy, everyone would be driving a Mercedes-Benz E 350 cabriolet!